Brilliant blue orchids, are supported with purple and fuchsia stock and vivid pink roses and softened with touches of white wax flower. 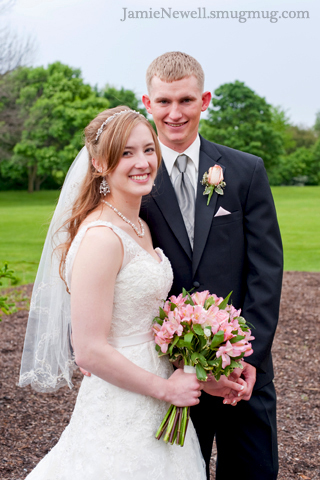 Thank you to the sweet bride and groom for choosing Blossom Basket to be your florist. 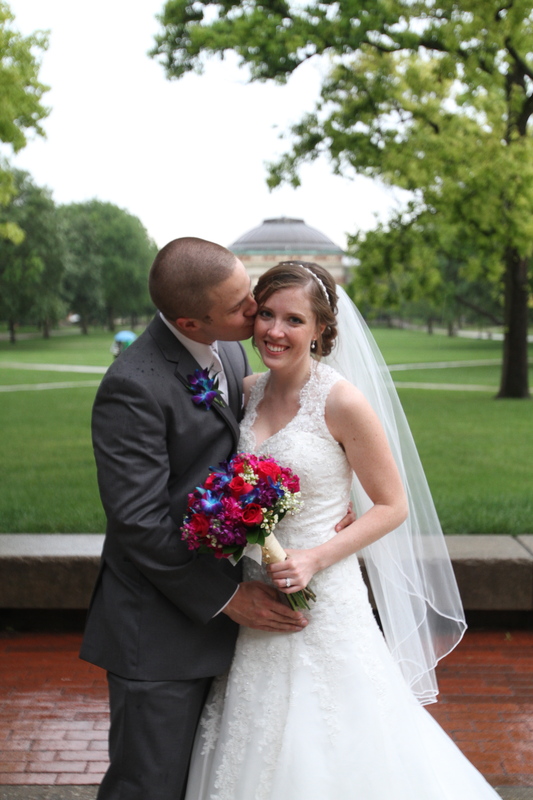 Thank you for sharing images of your wedding day – photos by Chelsea Fisher. 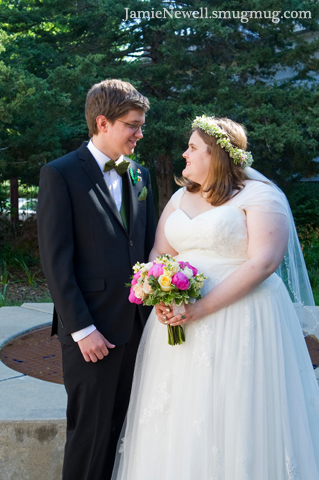 We have worked with professional photographer Mark Romine on many weddings over many years, his stunning images and artistic eye put him in high demand with Central Illinois brides. 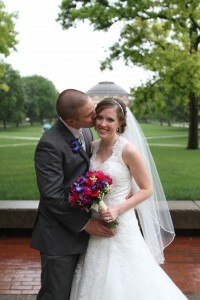 Recently, he emailed with a photographer’s perspective on the cascade vs. hand-tied bouquet option. 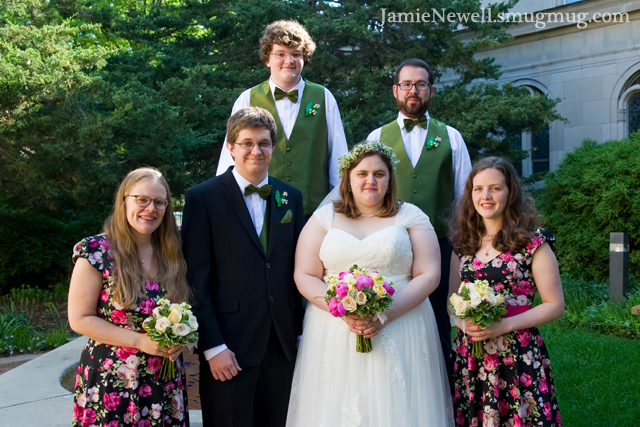 He also sent over beautiful photographs he captured during two recent weddings, one with a cascade bouquet and the other with a hand-tied bouquet – how perfect! Before we hear from Mark, let me give you some basic information about these two bouquet constructions and show you his recent images. It is important to note that there are instances where we combine these two styles, as in a hand-tied with an asymmetrical flow/ drop or a rounded version of a ‘holdered’ bouquet, but for comparative purposes we be talking about the more distinct versions of the bridal bouquet. 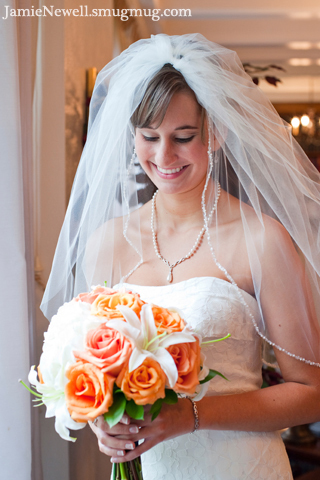 Hand-tied – This bouquet construction involves gathering and placing stems of flowers in a round design. 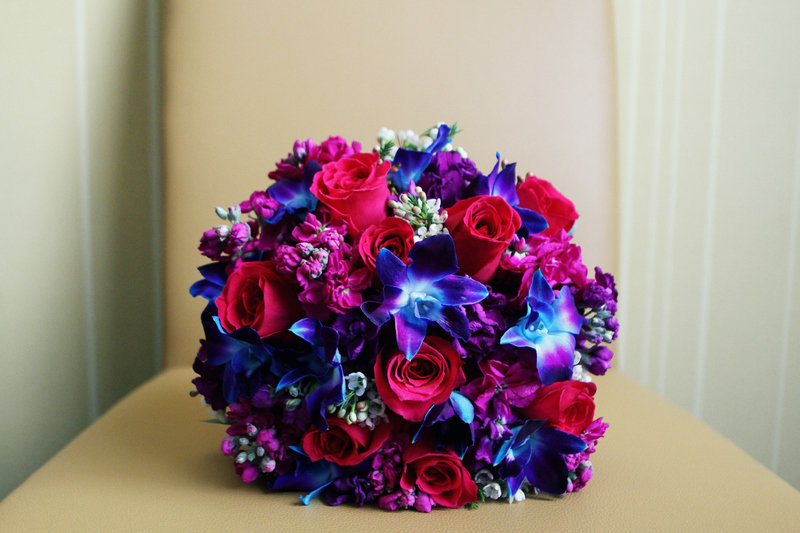 The bouquet is built in the hands of the designer and then bound together with ribbons. The bride then carries the flowers by the stems. Currently this is the most popular option. This construction works particularly well for brides who don’t prefer lots of greenery or like more of a dense flower-on-flower look, and brides who like a ‘just picked’ or very natural look. A major benefit of this style is the exposed stems which allow for nearly constant hydration. Cascade – Originally, the construction of a cascade was accomplished through wiring individual blooms into a flowing and draping design. These bouquets had no water source. With more modern floral technology, we now have the ability to construct this draping design with an internal foam water source, this allows for hydration of the flowers. The shape of a cascade is most often likened to tear drop or waterfall. 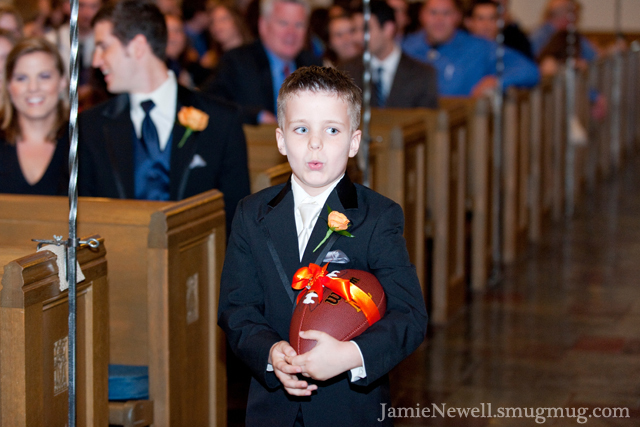 This style works particularly well for a traditional or dramatic presentation of flowers. A major benefit of constructing in this style is the precision of placement and shape. 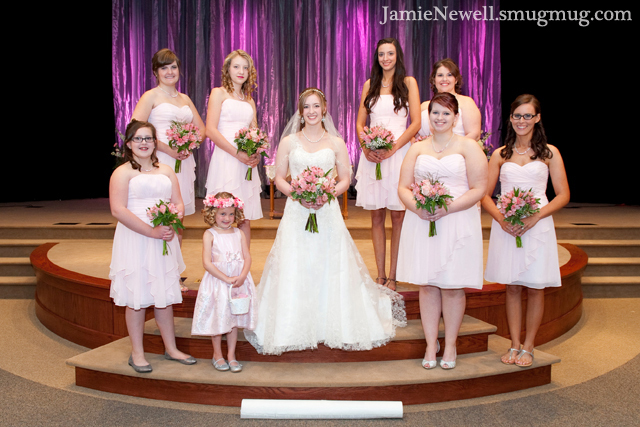 Photographer Jamie Newell sent us some wonderful photographs that she captured as photographer for three Blossom Basket brides. Enjoy these images, we hope they inspire you. Our wedding consultants would love the opportunity to meet with you to help you choose the perfect blooms to compliment your wedding day. 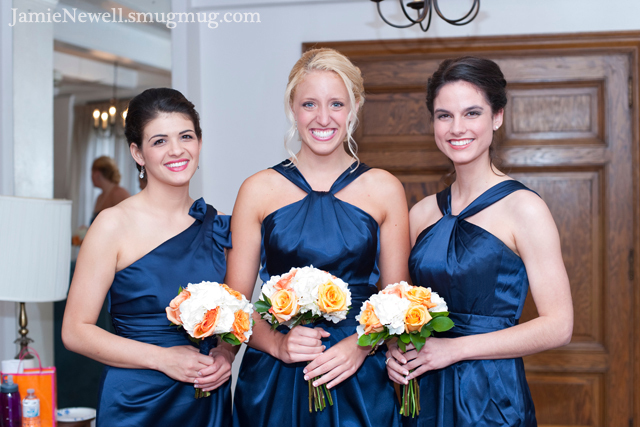 Thank to each of our brides for partnering with us to complete your vision for your wedding day. 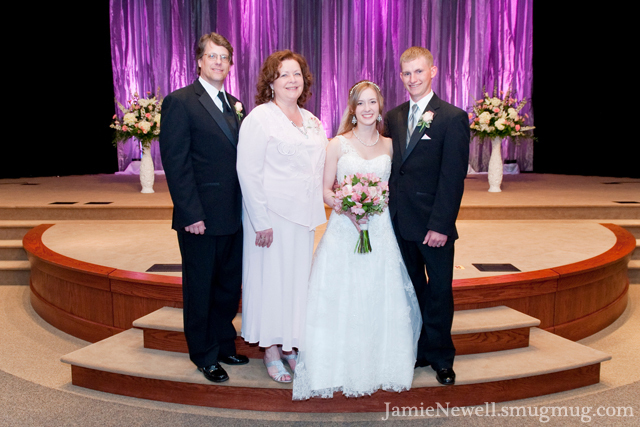 And thank you to Jamie Newell Photography for sharing your beautiful work with us.